Thake Home Comfort Centre began its business life as B. Thake T.V. & Radio in 1956. The repairs and sales of the “newest” of technology such as color televisions and transistor radios quickly progressed into household appliance sales and refrigeration service. In the 1990’s, the store moved from its previous location on Church Street to our current location at 24 Bedford Street, and with the move there was an ownership change, still remaining with the family, from Bill & Marlene Thake to Chris and Cindy Dopson. 10 year warranty on all parts and labour, specializing in air to air heat pumps and geothermal systems. Our yearly Comfort Club Plan ensures that you are protected for emergency service – you can reach us 24 hours a day, 7 days a week. We are committed to servicing the Westport and Rideau Lakes area as well as Leeds, Thousand Islands, Perth, Lanark, Sharbot Lake, and their surrounding areas. We make an effort to stay on top of all the current trends in energy efficiency, indoor air quality and environmentally friendly products. We regularly attend industry workshops and training sessions to keep abreast of the newest advances. Our technicians and office staff will provide you with friendly and courteous service and accurate advice for making all your home comfort decisions. Wondering if a heat pump is right for you? Curious about what a geothermal system is? Can you afford the most efficient? We are glad to help explain all these aspects, and enjoy finding just the right system for YOU. Give us a call or stop in! Why do we use horses in our logo? 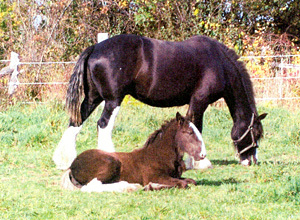 Well these are our “hobby” – Registered Shire Horses. Traditionally the “Work Horse” of England. And we will work hard for you too! Thake Home Comfort supports and is involved with Westport Heritage Festival.